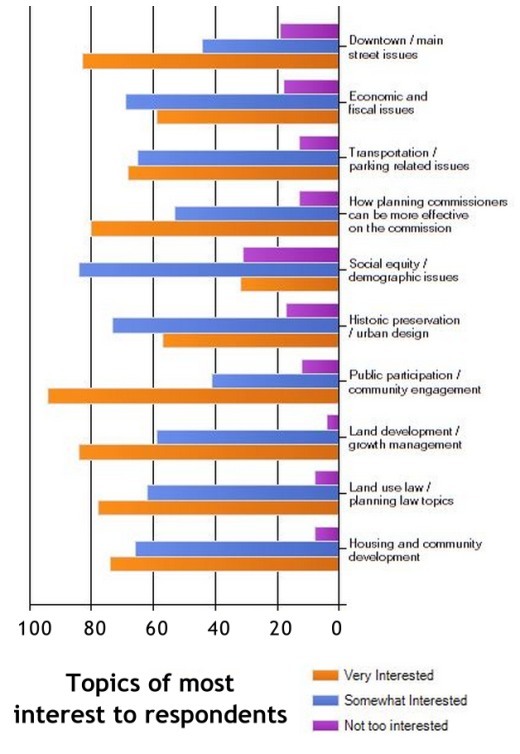 On PlannersWeb.com, we cover a wide range of issues from public participation and engagement to principles of zoning and land use. We recently conducted a survey to learn more about where our readers come from and what they’re most interested in hearing about. Special thanks to those of you who took the time to participate, and to Dan Rosenblum, our student intern, who helped with the survey. We want to share some of the survey results (as of October 28th) with you. 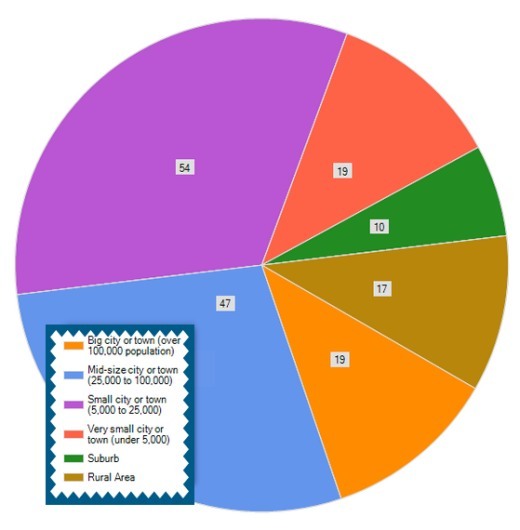 Of the 152 responses we received as of that date, 84% told us they are currently PlannersWeb.com members; 9% are not members; and 7% are not sure (note: if you're not sure about your membership status, please email us at: pcjoffice@gmail.com). Almost all of our readers come from the U.S. and Canada, though we do have some in Australia, the United Kingdom, Japan, and a few other countries. As the graphic below shows, our readers come from many different kinds of communities. That’s one of the challenges we face -- providing articles and information that will be of value to citizen and professional planners working in a diverse range of communities. We've tried to pay special attention to meeting the interests of readers in smaller cities, towns, and suburbs -- too often ignored by coverage focusing just on what’s happening in large cities. note: respondents could select more than one category (e.g., suburb and small city). What issues are most important to our readers? Nearly 75% of those responding to our survey also offered specific suggestions for topics we might consider covering in response to an open-ended question we also posed. Those responses are already providing us with useful insights for possible articles to work on for the coming year. How well do we connect with our readers via email and social media? But we also learned that far fewer people were aware of our presence on LinkedIn, Facebook, and Twitter. All three of these social media platforms provide ways by which you can easily keep up-to-date on new PlannersWeb.com content, and engage in conversations with both me (as Editor) and our writers. 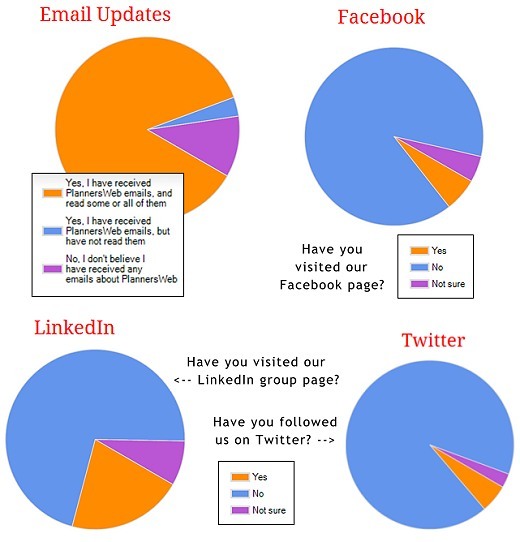 We've focused most of our attention on LinkedIn, since we view our LinkedIn group page as a great place to engage in discussions about new articles posted on PlannersWeb.com. Many of our authors also use our LinkedIn page and respond to reader follow-up questions about their articles. What’s more, our LinkedIn page provides an easy way for our readers to post questions or initiate discussions on topics they’re most interested in. As always -- thank you for the constructive and positive feedback that keeps us motivated to help communities grow and prosper through good planning! ... and we also value the good suggestions we received for ways of making our website better for our users!